Divinity bestowed upon man “. So, friendship is divinely bestowed upon man . Since friendship is divine it should be cherished by every individual. Friendship is no doubt useful. Friends help in difficulties,save us in our dangers and give us timely advice. Friends guide us when we are perplexed. They wish our well. They like us from the core of their hearts. We feel relieved when we tell our sorrow to a friend . A true friend is our asset. Friends share our sorrow and redouble our joy. When we are in pain and agony our friends soothe us. They console us . Now is the age of technology and science . We found so many friends , real and virtual through net. We should guard ourselves against the false friends. It is because some people pose to be our friends to meet their own interests. When their interests are met , they leave us. They sometimes betray us for their own interest . They never hesitate to sabotage . Such friends are more dangerous than enemies. They catch us by surprise. Besides false friends , there are another class of friends called summer friends or fair-weather friends . They remain with us when we are rich and leave us when we are wretched. They share our fortune but not our sorrow. We need not depend on such friends. The summer friends behave like summer birds. The summer birds come in summer and fly away when the summer moves away. However , those friends are less dangerous than false friends. There are another class of friends who are not at all the same. They are our part time companions. Sometimes we sit with them, talk with them, play with them and make merry with them . We call them friends by courtesy. Mate are not friends .We have our class-mates , school-mates , college-mates or office-mates. We move with them under circumstances We call them friends only for the shake of courtesy.True friends are very rare in this world. We can not spot a true friend . Sometime enemies come in the color of a friend and ruin us . Rather a noble enemy is better than a dishonest friend. We have to make right choice of friends . Otherwise in the course of life ,we will gather some who will desert us in our misfortune. On the other hand some will turn enemies for us . Some other will be used against us by our enemies. Though it is not easy to make a choice of friends , it warrants our conscience , consideration , induction and foresight for the job. For this ,we must have a deep insight into human character . There are instances of men sacrificing their lives for their friends . We must honor such friends . The story of Lord Krishna and Sudama was an example of great friendship . Krishna , the prince of Dwaraka , was a student inmate in the hermitage of the sage Sandipani . Sudama , a poor Brahmin boy , was studying at the same time in the same hermitage . Friendship grew between the two . Sudama had married early . His wife too was a good lady . Krishna used to go with Sudama time and often to Sudama’s house where He ate fried rice from the wife of Sudama . Time passed on . Krishna became the king of Dwaraka . Poor Sudama remained poor as before . Once his wife told him to go to Krishna with her fried rice as presentation . After much hesitation and reluctance , Sudama went to Dwaraka . 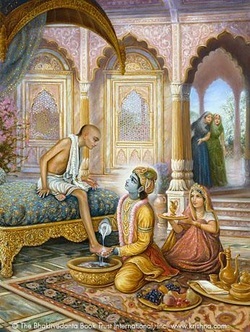 When Krishna saw him ,He took Sudama with all cordiality into His private apartment and washed the feet of Sudama . Krishna discovered the fried rice bound in the napkin of Sudama . He took it and ate it with great pleasure . When Sudama came back home he found that his condition had changed to the best by the grace of Lord Krishna . All the grievous sins are removed for one who worships Lord Sri Hari, the Lord of all lords, and chants the holy name..